Vanguard Lofts is a small condominium in the Rosemary District that nonetheless conveys the big leap of its locality as a prime destination for prospective buyers of Sarasota condos for sale. Located at 1343 4th Street, this condominium was developed attuned to Sarasota’s Downtown Master Plan 2020, a roadmap towards compact, walkable and mixed-use urban communities. The same smart growth principles are notably at work in the revival of the Rosemary District and its rise as Sarasota’s design district. 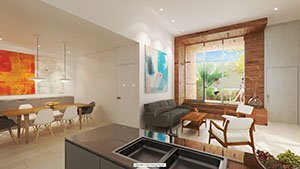 The Vanguard Loft’s concept fosters an urban live–work environment, a theme that has resonated in other recent property developments in Rosemary. This condominium was planned as a four-story building with a holistic architectural design featuring unique elements to keep its residents connected with their surroundings. Tetra Terra Development, the condominium’s developer, has allocated $2.4 million for this project. 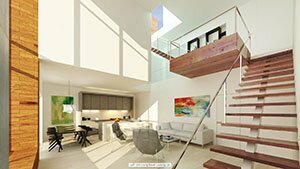 The company’s owner and president, Kevin Bryon, an architect himself, drew Vanguard Lofts’ concept from residential projects in some urban centers of California. He attests that the conditions in these places, which include the SOMA district and Hayes Valley in San Francisco, are quite similar with Sarasota’s characteristics in terms of walkability, scale, local amenities and climate. 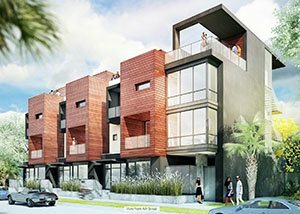 Tampa and Sarasota-based Halflants + Pichette Architecture rendered the design of Vanguard Lofts. Its rendition bagged a couple of awards in 2014 prior to the condominium’s groundbreaking in 2015. These citations include a national award from the Association of Licensed Architects and a merit award from the American Institute of Architects. Other pros in delivering high-quality Sarasota condos for sale are behind the Vanguard Loft project. Amongst these specialists are construction manager Crowley Services, the full-service DWY Landscape Architects, and engineering consultants Jensen and Group. This condominium is composed of just six townhouses with choices in either garden or loft designs. 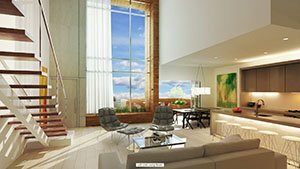 Each garden unit has two bedrooms and two baths within a total floor area of 2,280 square feet including a 1,468-square-foot ground floor. 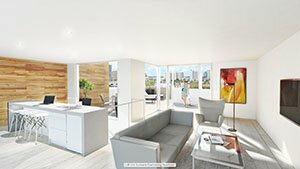 These units also feature a landscaped yard each and share a 425-square-foot rooftop terrace with unobstructed downtown views as well as partial views of the Intracoastal Waterway. Each loft unit, located on the building’s second and third floors, has a total floor area of 2,325 square feet designed with three bedrooms and three baths. These condos have their own private roof terrace and balconies in all bedrooms. Pricing of Vanguard Loft condos for sale are in the $700s–$800s range. Each of the townhomes come bundled with a private two-car garage, plus ample outside parking for live/work professionals. Other condo amenities include a 625-square-foot ground floor lobby, elevator service to all floors, fitness facilities on the second floor and a 235-square-foot conference or media room on the third floor. Besides young urban professionals, the residences of Vanguard Lofts are suited for active retirees and young families. This condominium is centrally located close not only to the life and leisure hubs of downtown Sarasota. It also enjoys close proximity to the city’s centers for health, education and culture supportive of a lifestyle that prospective buyers of Sarasota homes for sale look for. Below are all of the current condo listings available for sale at Vanguard Lofts.